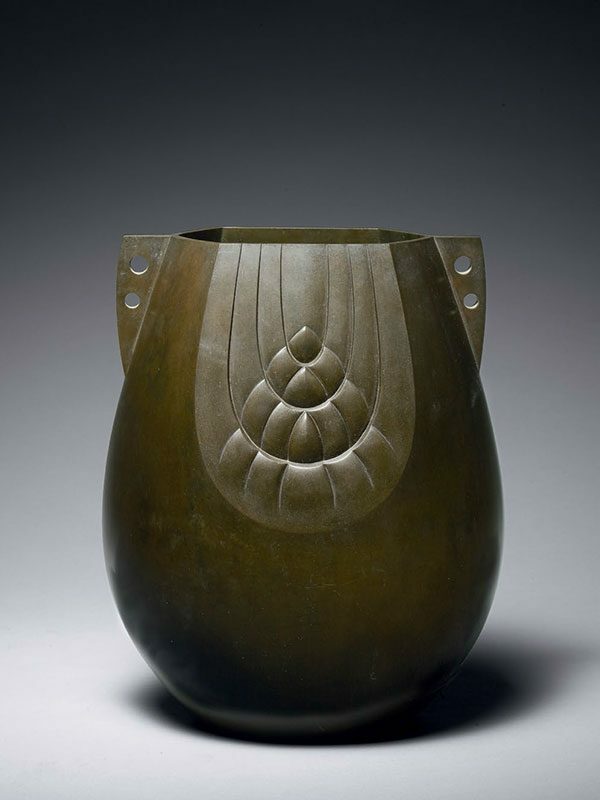 A bronze vase of flattened hexagonal outline, the sides rising from a flat base and gently tapering inwards towards the mouth. Each of the flat sides is decorated with a U-shaped panel depicting a stylised barley sheaf in repoussé. The vase has two flat handles jutting out from the short sides; the handles have been drilled with two holes each. The base is engraved with the three-character signature of Akijo. The vase is contained within the original wood tomobako, which is inscribed Chudo mugimon kabin, Yoshikawa Shujiro dono keison, Takigawa Gisaku keizo, Watanabe Akijo saku, and the seal: Hattori tokei ten (Made by Watanabe Aki (Watanabe Akijo); cast bronze flower vessel, with the motif of barley sheaf, this is a gift item from Mr Takigawa Gisaku to Mr Yoshida Shujiro). The maker of this vase is Watanabe Akijo (Watanabe Aki). The name suggests that this is a female artist, but nothing else is known about her. Takigawa Gisaku (1874 – 1963), who gifted this vase to Yoshikawa Shujiro, was a successful business man, a nobleman and politician at the Upper House, and an industrialist tycoon, who was known as the ‘King of Matches’. He was based in the Kansai (Nara, Osaka, and Hyogo) region and had many match-making factories inland and abroad, including one in China. The Takigawa family founded the private junior and high schools in Kobe City, Hyogo prefecture in 1918. Yoshida Shujiro, the recipient of the work, is likely to be the Chief of the Kobe Stock Exchange, circa 1935.